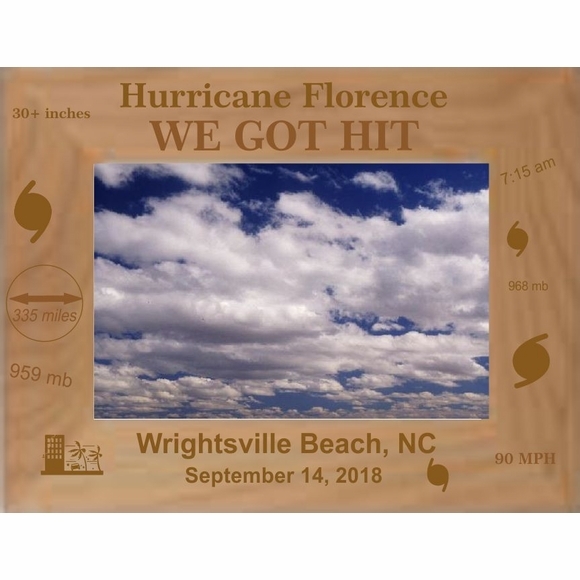 Hurricane Florence We Got Hit Picture Frame - - custom made for your keepsake photo. "Hurricane Florence" and WE GOT HIT are standard on this frame. The location and the date you supply are engraved right on the frame. This frame includes two lines of engraved personalization (up to 30 characters per line) for the location and date of your photo. Month, Date, Year on Line 2. Frame is made of red alder wood and has a horizontal orientation. Frame holds a 4x6 horizontal photo. Overall frame size: 8.625"W x 6.625"H.
Includes an easel back stand for table or shelf and a hook for hanging on a wall. Custom-made Hurricane Florence keepsake picture frame is awaiting your keepsake photo.